Since most club announcements go out via e-mail, I haven't been updating this. I finally got around to updating the calendar for the year. We have some neat things going on this year, including our first ever "normal" meeting in Marquette! Check it out to see what we've got going on for the year. If for some reason you're not getting the e-mail updates, please make sure to contact one of the club officers. I hadn't realized how long it's been since I've updated this until the other day. Other than our regular meetings and our National Homebrew Day get together, there hasn't been much to report. This is the first time since the club's first year that we didn't have a Spring event, which has been kind of nice honestly. Right now we're gearing up for the UP State Fair Homebrew Competition! Check out the link on the left for more info on that. This is the first year that we'll have a drop-off point in Marquette, so thanks to White's Party Store! Also this year the winner gets to brew up at Blackrocks Brewery in Marquette, so that's exciting as well. Feel free to contact one of the club officers if you're interested in judging or stewarding for the comp. Well Brewers, it's been a great Fall! Those of us who went up to Marquette had a blast, and UPtoberfest raised a significant amount of money for The United Way of Delta County. This month we're getting back to somewhat normalcy, except we're having our meeting on the first weekend of November instead of the second weekend due to hunting season. This month we're pleased to again welcome Stu Stuart from Belgian Beer Me to do another presentation on the incredible variety of beers from Belgium. Hope to see you there! August 26, 2010 - Fall Meetings, BdNBs hit the road! Coincidentally, both our September and October meetings fall on the dates of beer festivals (darn!). For our September meeting, we have chartered a bus up to the Michigan Brewer's Guild fest in Marquette. We'll be doing a presentation on the Oktoberfest/Marzen style of beer on the way up. There are still a few seats available for the bus at $20 each so if you're interested, contact one of the officers right away. Tickets for the fest are available here. Our October meeting of course falls on the same day as UPtoberfest. Essentially, UPtoberfest will be our monthly meeting. Tickets are on sale now at www.uptoberfest.org. Hope to see you at the fests! Our inaugural Camping trip is next weekend at Chicago Lake in the Hiawatha National Forest. Driving directions from Escanaba are here. We'll be at site 4 (right by the boat launch) the nights of August 6th and 7th. Even if you can't stay the night, stop on out for a beer! We'll also be brewing a batch of mead to celebrate National Mead Day. April 15, 2010 - A Call to Arms? Nay, Pens! April 11, 2010 - Big Brew Day and more! First I'd like to thank Matt Sviland for an incredible tour of the old Richter Brewery yesterday. What an experience! If you weren't able to make it, pics are up here. Also Pete Strom put together a PowerPoint presentation for the historical society that is available in the downloads section of the site. In upcoming events, we're celebrating National Homebrew Day for the third year now on May 1st. We'll be brewing all morning and afternoon at Josh Marenger's house - 1008 2nd Ave N in Escanaba. Brats and burgers have been donated by Reinhart Foods, but a dish to pass would be appreciated. All are welcome, whether you want to haul down your brew equipment, watch and learn, or especially non-members. See you there! As has been posted on the right for some time, our March meeting is TONIGHT at H&H at 7PM. Hope to see you there! For our April meeting on the 10th we have something exciting - Matt Sviland is giving us a tour of the old Richter Brewery (Delta Building on Ludington St in Escanaba). We will be meeting there at 6:30 for the tour, then going back to H&H for the remainder of the meeting. Also for those of you who have Facebook, I've created a Fan Page for the club. Brian had created a Group some time back, but the Fan Page allows news to be posted on your Wall, allowing you to follow a bit more passively. You can become a fan here. Our collaboration beer dinner on Sunday with Hereford & Hops couldn't have went better. We had some great beer and food, which made for amazing pairings. If you missed out, I'm sure that we'll be doing this again, but the date is TBD at this point. Also, we have two new benefits to being a club member this year. The first is 25% off CO2-related supplies from American Welding and Gas in Escanaba (thanks go out to Jeff Dubord!). The second is access to a library of homebrewing books that the club has started. We've purchased 7 brand new books and a subscription to Brew Your Own this year, and plan to continue growing this. These will be available at each meeting, and due back at the next meeting. Check out the list of books here. One final thing, you'll notice the "Quick Calendar" on the right now for easy access to our upcoming events. Details on these can still be found on the events page. From here on out, all meetings will be held on the second Saturday of the month, unless otherwise noted. The odd months will focus on a particular style, with the even months focusing on an educational topic. Our next meeting will be 1/16 at 7PM. Also, don't forget about our beer pairing dinner on 1/31! The next BdNB meeting will be held Sunday, 12/6 at Hereford and Hops. Also we will be having a beer pairing dinner at Hereford and Hops on 1/31. The cost is $40 and will include 5 beers plus appetizer, soup, salad, entree, and dessert. If you wish to attend, please bring payment to the December meeting. Also don't forget about UPtoberfest on 10/10! Well our first Big Ole Festival has come and gone. We were fortunate enough to meet quite a few people who were interested in brewing. All of the brews are fermenting away and fun was had by all, despite the rain yesterday. I'm also happy to report that our first ever homebrew competition as a club was a success! We had 45 entries total, which is about the number that we were equipped to handle. Click here to see the list of winners! On a side note, UPtoberfest planning is trucking right along. Expect to see the website completed by the end of the month at uptoberfest.org. Now that Big Ole is done we can really focus all of our efforts here and make this a great event! I admit I've been a little lax in keeping this site updated. As most of you know, we have many pans in the fire! -Big Ole's Pioneer Days - This is coming up very quickly! Don't forget to join us at the UP State Fairgrounds June 26/27 for brewing demos. Also if you have any beer to enter in the competition, please get that ready! -Bay de Noc Brewers on the radio - Tune in to these stations to hear Josh discuss the club on-air! -Border Worts I - Judging is this Saturday, 6/13 at noon. We're having a meeting to go along with this event as well, so be there! -UPtoberfest - Initial planning has begun! If you'd like to help, the next meeting is 6/16 @ 6PM. I probably should have posted this sooner, but the Bay de Noc Brewers will again be celebrating Big Brew Day on 5/2. Hopefully the weather will be better this year! Jeremy Drury is hosting at his home, 930 South 17th St in Escanaba. We plan on mashing in for the all-grain batch at 11AM and will start the extract batch around 12:30. We'll also have food, so bring a dish to pass if you like! Hi there brewers, we covered a lot of stuff at our last meeting--so much that we went a little long with the business end of things and never got to do our talk on "getting started with extract brewing". So if you missed the last meeting and are still wanting to learn a little about extract brewing, you didn't miss it. We will be going over that at our next meeting which will be held on Saturday April 25th at Hereford & Hops, 7:00 PM. We will also be getting everyone signed up for judging at the Big Ole Homebrew competition. Jack Mellinger has invited us to come out to his farm on Saturday to brew an all-grain Maple Nut Brown Ale. Maple sap will be used instead of water, which lends about 4% sugar content. Brewing will begin at noon. Directions: From Rock, go West on Maple Ridge Road 5.5 miles to Homestead Road. Turn left and follow until the road ends at a farm house. 13340 Homestead Road. A map with directions from Escanaba located here. If anyone is interested in carpooling, throw a post up on the forum! Bay de Noc Brewers meeting. March 21. 7 PM. Hereford and Hops. Be there or be... less educated about brewing than otherwise? We have updates on the Big Ole Festival, UPtoberfest, National Mead Day, and more. I've also heard a rumor that there will be beer as well. Our next meeting will be February 21, same bat-time, same bat-channel (H&H basement, 7:00 PM). We flipped back to a weekend this time but will definitely have more weekday meetings after a strong turnout in January. Hope to see you there! Well the BdNB's are entering our second year and I think that last year exceeded the expectations of literally everyone. Our meetings were much larger than ever anticipated and we were able to survive solely on the dontations of members. We now actually have elected officers (see the Contact Us page) and are working diligently to make the club a little more structured so that it is more enjoyable for all. With structure comes structured dues so we can have a solid budget to work with for the year. Click on the Join Us link on the left for more info on that if you didn't pay dues at the January meeting. Lastly I implore everyone to join the forum and contribute! This site is getting almost 500 visits/month yet the forum has comparatively little activity. Don't be shy, get on there and start posting about your brewing experiences/questions! This has been out there for awhile but I've been slacking in posting due to the craziness of the holidays. It's a new year and we're going to try something a little different for our first meeting - a weekday! We'll be meeting on Tuesday, January 13 at 6:30 PM at the usual locale (H&H's basement). Hope to see you there! This may be a bit outside of our normal "jurisdiction", but I feel that it's worth pointing out. The House is trying to pass a bill that will over-regulate direct sales of wines to consumers and will also clearly prevent shipments from out of state wineries. There is more info on this here and you can read the entire bill here. This is not a good path for us to travel down as consumers of the finer types of alcohol. Please contact your state rep for Delta, Menominee, and Dickinson counties or Alger, Luce, Marquette, or Schoolcraft counties and voice your opposition to this bill. Our next meeting is going to be on November 8th at 7:00 p.m. We will be meeting in our usual spot in the basement of Hereford and Hops. At the meeting we will be discussing ideas for our upcoming club Christmas party, talking over ideas for a homebrew competition in the spring and passing out a copy of the National Teach a Friend to Homebrew Day recipe. We will also have the opportunity to pre-purchase Bay de Noc Brewer's t-shirts for $7 each. One thing to keep in mind is that entries for the IPA club-only competition are due at this meeting as well. If you, your friend/neighbor/relative/pet snake have never brewed a batch before, this is yet another chance to see the process. The American Homebrewer's Association celebrates this international event to help introduce people to the hobby/obsession that is homebrewing. More info directly from the AHA here. This event is graciously being hosted by Ben Harris at his home, 806 S 17th St in Escanaba. Also on hand will be Mike Sattem, H & H's brewmaster. Mike has never brewed a batch of homebrew before, so this will be a new experience for him as well. Bring your friends and neighbors but leave your pet snake at home. The kettle gets fired up at 1PM on 11/1 so don't be late if you want to see the whole process. October 14, 2008 - Next Meeting will be 10/18! Our next meeting is going to be on October 18th. We will be meeting in the basement of Hereford and Hops at 7:00 p.m. At the meeting we will be discussing our plans for the upcoming National Teach a Friend to Homebrew Day, tasting the latest �craft� beer attempt from one of the big breweries, discussing recipe formulation, tips and techniques, and as always sharing some excellent brews amongst our club members. Also, this meeting will be the last chance to sign up to be on the ballot for our first club officer election. After this meeting the ballot will be closed, with the vote to take place at our November meeting. The U.P. 's one and only beer festival is coming back this weekend, October 4th! It's at the same location as previous years, behind Hereford & Hops, from 2-7PM. We'll be handing out flyers, brewing a batch of extract beer, and handing out homebrew samples throughout the event. All proceeds benefit The United Way. Make sure you stop by and say hello! If you didn't see the calendar entry I added a few days ago, our next meeting will be held at H & H this Saturday 9/13 at 7PM. August 9, 2008 - Pictures! As you may have noticed, the Pics section is alive and populated with photos from both Big Brew Day as well as National Mead Day. Thanks to our photographers Ben Harris, Doug Peterson, and Lisa Ebner, Enjoy! Come join the Bay de Noc Brewers for National Mead Day on August 2nd! We'll be taking a tour of the Threefold Vine Winery in Garden, MI at 11AM. Following that we'll be having our club picnic at Sac Bay Park. We will be grilling brats and burgers, so bring a dish to pass and a few homebrews to share! Take US-2 east to the intersection of highway 183. Take highway 183 south towards Garden. Go through the town of Garden to the intersection of NN Road. Turn left onto road NN and follow the signs to the winery. Take NN road back to Highway 183. Turn south (left) onto highway 183. Continue past Fayette and turn right onto 8 road (Sac Bay Road I believe). The park is at the end of this road. 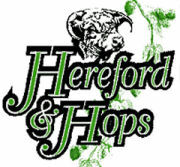 Special thanks to Hereford & Hops for all of their support!